Students who complete first-year engineering requirements can apply to CODA and declare a major in one of our department’s degree programs. Career Focus Biological engineers apply engineering principles and the fundamental concepts of biology to agricultural and biological systems and tools, ranging in scale from molecular to ecosystem level, for the safe, efficient and environmentally-sensitive production, processing, and management of agricultural, biological, food, and natural resources systems. Senior Design Capstone Experience Two semester course sequence (BAE 451 and BAE 452). Teams are presented with real-world problems and each must work together to analyze the problem, design and construct an innovative solution. Jobs and Salary Agricultural Engineers Occupational Employment and Salary, Bureau of Labor Statistics. Salaries are also similar to that of Civil Engineers Occupational Employment and Salary Bureau of Labor Statistics. 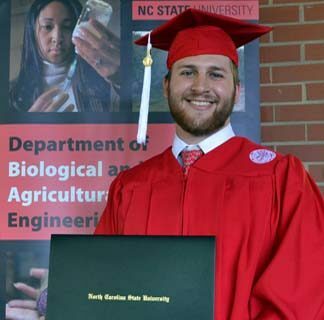 Career Focus Biological & Agricultural Engineering Technology graduates apply science, technology and business principles to effectively manage agricultural and environmental systems. Jobs and Salary Agricultural Technologist Occupational Employment and Salary, Bureau of Labor Statistics. Career Focus This Biological & Agricultural Engineering Technology Minor provides students an opportunity to apply engineering and information technology to production agriculture and environmental systems. The minor is open to all students at NC State except students majoring in Agricultural and Environmental Systems (AES). The program is flexible to emphasize the students area of interest. 15 credit hours with a grade of ‘C’ or better. At least one course must be selected from BAE 323, 332, or 432 NC State BAET Minor page (shown in bold in elective course list) for awareness of environmental issues. A description of these BAE courses can be found in the course catalog. What else adds value to our degrees? Professional Organizations and Honoraries to engage and network outside the classroom. Study Abroad and international high impact experiences for global exposure and understanding. Undergraduate Research to acquire the investigative skills of a researcher. Cooperative Education (Co-op) and Internships to work in the profession while getting your degree. Professional Engineer (PE) Licensure for broader certification in the field. Order of the Engineer: Introduction to the Profession to join the professional engineering community. For exploring job possibilities and finding your future employer, look to College of Agriculture and Life Sciences career services and the Engineering Career Fair.